Born Sydney, Australia 1939. From 1948-56 Brett attended Scots College, Bathurst and Sydney. In 1956 through 1959 he worked at Lintas Agency and studied sporadically at Julian Ashton Art School, Sydney. 1959 saw him awarded an Italian Travelling Scholarship at the age of 19; first living in Rome and then Florence in 1960 with his girlfriend Wendy Julius. In 1960 they moved together to London. During 1960-62 Brett exhibited his work in London, Paris, Germany, California, Amsterdam and Berlin. In 1961 Brett was awarded a grant under the Dyason Bequest from the Art Gallery NSW, which allowed him to stay in London. In the same year he was invited to hang three works for a show “Survey of Recent Australian Painting” at the Whitechapel Gallery in London. Also that year he was awarded a special Commonwealth Arts Advisory Board Scholarship, which helped him stay in Europe. Whilst in Paris he was awarded the International Prix of the 2nd Biennale, Paris, des Jeunes Peintres et Sculpteurs. March 1962 he held his first solo show at Matthiesen Gallery, Bond Street, London where he exhibited his first abstraction works. In March he married Wendy Julius and they set off with Clem, Brett’s father, on a journey through Europe. Then Brett and Wendy spent the summer at Sigean where Brett painted abstractions. In 1963 Brett participated in “British art in the sixties” at the Whitechapel Gallery in collaboration and simultaneously with the Tate Gallery in London. This year also saw his first Sydney one man show at Rudy Komon Gallery. In 1964 he participated in “The New Generation 1964” show at Whitechapel Gallery in London with a group of young upcoming British artists. This exhibition marked an upsurgeance in the visual arts of British painters. That year he also won an international drawing prize in Darmstadt Germany for “Bather and Heater” from his bathroom series and a Perth Festival Art Prize in Australia. 1965 saw his Christie and Zoo series exhibited at the Marlborough Gallery in London. Throughout the rest of the 1960’s he and Wendy travelled and lived in London, Sydney, Majorca, Tangier, New York and Fiji; these places heavily influenced his art. In December 1965 they returned to Sydney with their daughter Arkie and spent the summer at Whale Beach returning to London via Calcutta in mid-1966. Right throughout the 1970’s and 1980’s he received huge acclaim; he continued to travel throughout the USA and Asia exhibiting constantly, his output was prolific. In 1976 he won the coveted Archibald Prize and Sulman Prize in the same year. In 1978 he won the Archibald, Wynne and Sulman Prizes - the first artist to win all three major Australian art prizes in the one year. Two of the reproductions “Lavender Bay in the rain” and “Grey Harbour” were painted during this extraordinary period. 1991 Brett was awarded an Order of Australia. In 1989 he painted his Paris series “Regard de Cote”, and from this series comes “15 Great Dog Pisses of Paris”. This series was originally exhibited in 1990 at the Art Gallery of NSW and subsequently after his death at the Australian Galleries. The last studio Brett had was a run-down T-shirt factory warehouse in Surry Hills, which he bought in 1985. Following his split with Wendy in 1987 he lived and worked there until his death in 1992. Despite his success Brett had struggled over the years with drugs, alcohol and personal trauma. He was only 53 years old when he died. 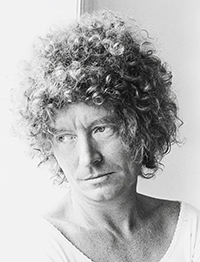 After Brett’s death and following his wishes to create a museum, Wendy and Arkie helped to establish The Brett Whiteley Studio as a public exhibition venue and museum; it opened to the public in February 1995 and comes under the umbrella of the Art Gallery of New South Wales. Wendy Whiteley maintains a critical and active role in the Studio and its activities. Brett Whiteley’s work is represented not only at The Brett Whiteley Studio but also in all the major public State and Territory Galleries in Australia including many regional galleries and private collections. Overseas his work is held in many international galleries including the Tate Gallery, London and the Museum of Modern Art, New York. # Extract from Foreword by Edmond Capon, Director Art Gallery of NSW in “Art & Life” Barry Pearce, Bryan Robertson & Wendy Whiteley. * Extract “The encyclopedia of Australian Art” Alan & Susan McCulloch. This biography compiled by: Wendy Whiteley & Melissa Lock, Digital Art Directory.